Singing music outside of one’s own cultural “comfort zone” can be a challenge, a risk, and also an amazing adventure. For some singers and conductors that new exploration might be Orthodox repertoire in church-Slavonic or the dance-inspired rhythmic complexities of a Latin American piece. For others it could be an African-American gospel score or even a Bach cantata. A conductor willing to do this kind of cultural-choral exploration is often challenged to find a musical guidebook for the new culture. 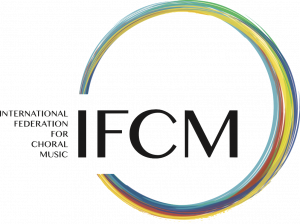 How many of us register to attend an IFCM World Symposium, and then, as a part of our planning, also buy travel books for Japan (WSCM-8) or Argentina (WSCM-9), or get online and read about that country’s culture, customs and language? But what if we want to explore the choral music of, say, Asia – where is our musical ‘travel book’? 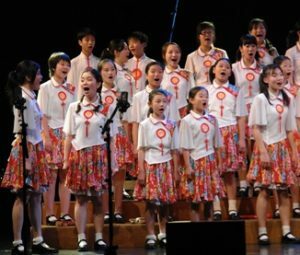 While not meant to be comprehensive, this two-part article is, hopefully, a helpful initial roadmap for beginning your journey of Asian choral music. 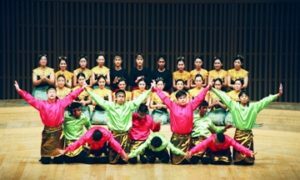 This article (Part 1) covers music from China, India, Indonesia, Japan and Korea; Part 2 will explore scores from Malaysia, Mongolia, the Philippines, Singapore, Taiwan and Thailand. The first challenge for a conductor who desires to investigate music from these countries and cultures is finding scores. Some Asian composers circulate or sell their own scores, some scores are published with national publishers who may or may not have a website or web pages in other than the local language, and still other scores are published by western choral publishers. Notation of music and texts may also be a challenge. For example, an Indonesian composer’s manuscripts may be written in notasi angka (cipher notation), which is often used for gamelan music. Therefore, choirs from outside this region may be dependent on whether or not western notation ‘translations’ of the music are available. Similarly, languages with symbolic scripts (Tamil, Japanese, Korean, etc.) may need to be transliterated into a phonetic Roman-based script in order to make a score more easily accessible to other choirs globally. Finally, there is the issue of cultural context: of understanding a region’s customs, history, faiths, geography, languages, etc. For those of us who do not live in Asia but wish to learn about this repertoire, we are fortunate to have internet, social media, and video sites which provide resources and networking possibilities that were not available even a few years ago. We can invest time in ‘virtually’ visiting a score’s Asian homeland and begin to study its culture and customs. Incidentally, many Asian composers, choirs and choral festivals not only have their own websites, but they are also now posting on YouTube, Facebook and MySpace. With a few exceptions, the scores cited below are written by native composers and are a cappella (acap) unless noted otherwise. Most scores are published; publishers’ contact information appears at the end of this article. A few scores are available from the composer, as indicated. Scores with texts in the native language are transliterated into Roman characters. Many of these scores also have videos online, so I urge you to go and explore! Finally, I want to express my personal thanks to all of the composers and conductors who corresponded with me during the process of gathering this information. May your native scores find new global homes and build fresh and creative cultural bridges. Born in Guangzhou, Guangdong, China, Chen Yi was the first woman to receive a master’s degree in composition in China (1986) when she gave an evening concert of her orchestral works in Beijing, performed by the Central Philharmonic of China. A composer-in-residence with Chanticleer, now a university professor of music in the U.S., Dr. Chen has composed/arranged a large number of choral scores for various voicings including A Set of Chinese Folk Songs (10) available in satb (optional piano), sa+strings, or ttbb (acap); Chinese Mountain Songs (5) for women’s choir; Tang Poems (acap satb or ttbb); Chinese Myths Cantata (ttbb, orch); and To the New Millennium (satb, S, MzS) set to texts by Du Fu, Wang Wei and Cao Cao. Dr. Chen’s scores are published by Theodore Presser; a list of her choral-vocal scores is available online (http://bit.ly/a5K8xj). Shui Jiang Tian, born in China but now working in Singapore, arranged Usuli Boat Song (satb, T; Earthsongs). Ying Zhang won the Wen Hua Prize for his compositions based on classical Chinese style, for example, River Snow (satb, ba-wu/flute harp; Walton-WDW1011). A graduate of Shanghai Conservatory, Bright Sheng (www.brightsheng.com) is a conductor, pianist, opera/theater composer. He served as the Artistic Advisor to Yo-Yo Ma’s “Silk Road Project.” In both The Boatmen’s Song (ssaa, perc, harp; G. Schirmer) and Two Folk Songs from Qinghai (satb, orch; G. Schirmer), Sheng “blends Eastern folk idioms with Western techniques to produce music of unusual sophistication and expressive power.” Leon Shiu-wai Tong’s article “Four Chinese Composers” (ICB, 2007-3) is an additional Chinese choral resource. Born in Mumbai, Vanraj Bhatia is considered to be one of India’s leading classical composers. Six Seasons (satb, Earthsongs) was commissioned by Coomi Wadia, conductor of the Paranjoti Academy Chorus. Each piece in the collection is based on the rāg (raga = traditional Indian mode) associated with that season. Acclaimed Indian choral composer-conductor Victor Paranjoti wrote Dravidian Dithyramb (satb, ssaa or ttbb; Earthsongs), set only to the syllable “na.” The word Dravidian is a reference to southern India; a dithyramb was a wild, passionate Greek hymn sung to Dionysus the god of wine and fertility. The composer writes, “Dravidian Dithyramb is an expression of uninhibited festivity. An elusive but persistent pulse motivates the music, the pulse driving onward faster and faster toward the final frenzied utterance.” His score Svaagat (satb, Hindi, Earthsongs), an Indian song of greeting and peace, is based on the rāg parasu ragam which is traditionally sung between 3am and 6am to invoke love and devotion. Allah Rkah Rahman, an internationally renowned film composer, has sold over 300 million soundtracks. Called the “Mozart of Madras” and the “Music Storm,” Rahman wrote Jai Ho for the Oscar-winning film Slumdog Millionaire. Global music conductor Ethan Sperry received permission from Rahman to arrange the piece for satb and percussion (satb; Earthsongs). A language guide for the Hindi text is available. Rahman wrote Zikr (satb, perc; Earthsongs) for the documentary film Bose: The Forgotten Hero and is based upon the music of the Sufi ‘whirling dervish’ tradition where a simple melody increases in intensity as the piece unfolds. Sperry has also written Jai Bhavani, based on a Sanskrit prayer (sa, perc. ; Earthsongs) and Ramkali (ttbb; Earthsongs) based on the complex raga of the same name. U.S. composer-conductor Eric Banks (http://bit.ly/973EEr) has spent considerable time in India, learning the various cultural traditions for his scores. Sarasvati (2008) is a setting of two ancient hymns to the Hindu goddess of music and enlightenment, including melodies from the mantra Sarasvati vandana, as well as three verses of the Vedic hymn to Sarasvati (Rig Veda 1:3:10-12), in both Sanskrit and English, translated by the composer, for sixteen-part chorus (sssaaatttbbb) a cappella. The choral music from this country of 17,508 islands and over 230 million people is indeed a rich multi-cultural treasure. From Budi Susanto Yohanes comes Janger, a traditional Balinese dance (satbb), Gai Bintang/Reach for the Stars (ssaattbb; Balinese) a setting of a Madurese play song with Gamelan-like textures, and the Banyuwangi celebration folksong from East Java, Luk Luk Lumbu/The Taro Leaves Bend (ssaattbb, S; Osing). All are published by Earthsongs. Rindu kepada kediaman Allah/Psalm 84 (satb; Carus) by Daud Kosasih, Chairman of Medan Choral Society, uses a Javanese pentatonic scale. Composer-conductor Pontas Purba‘s Siksik Si Batu Manikkam (ssatb, S; Batak; Earthsongs) is a popular Batak song from Sumatra, the theme of which is “beauty is worthless if you don’t have a beautiful character.” Part of the text is syllabic; the musical texture is very gamelan-like. Christian Tamaela‘s Toki Gong/Beat the Gong (satb; Hinshaw HMC2135) imitates in words the exuberant sound of an Indonesian drum. For many years, Canadian composer R. Murray Schafer‘s Gamelan (satb or ssaa; syllables; Arcania) has been a very popular score for vocal exploration of the gamelan style. Other important Indonesia composers are Alfred Simanjuntak, Bonar Gultom and Ronald Pohan. Thanks to publishers in Japan and Europe, to his own excellent choirs, as well as to a strong internet presence, the work of composer-conductor Ko Matsushita is becoming globally known. Updates about his compositions are available from his website (http://komatsushita.com/en) and Facebook pages, and videos of his choirs are on YouTube. His many folksong settings embody his vision of “projecting the tonal characteristics of the Japanese music into music for chorus.” Elegant, challenging, and often scored for divisi a cappella ensembles, these folksongs are available mostly in collections (satb, ssaa or ttbb; Japanese with Roman transliterations; Edition Kawai). His numerous Latin-texted a cappella scores for satb-div include O salutaris hostia, Jubilate Deo, O lux beata Trinitas, Pater noster (all published by Carus) and Missa tertia (Sulasol). Latin-texted a cappella treble scores include Ave Maris Stella, Miserere mei, Tantum ergo, Christus factus est, Haec dies published by Sulasol and Hodie Christus natus est (Carus); also a Missa Secunda for ssa and organ (Sulasol). His Ave Maria setting is available in satb, ssaa and ttbb voicings (all 3 via Sulasol; satb and ssaa via Edition Kawai). Sakura/Cherry Blossoms, known worldwide, has many choral settings including these fresh, contemporary ones (all in Japanese): Takatomi Nobunaga includes Sakura in his collection Nostalgia (satb, ssaa or ttbb; Kawai); Chen Yi, simple yet elegant 5-voice setting written for Chanticleer (satbb; Presser 312-41748); an extended challenging setting by Toru Takemitsu (satb-divisi; Schott); and a treble version by Dwight Okamura (ssaa; Alliance-AMP-0120). 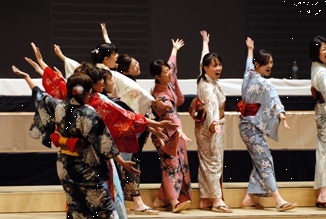 An accessible satb folk score is Osamu Shimizu’s arrangement of Sohran Bushi / Fisherman’s Work Song (satb; Jap; Ongaku No), and a very popular folk score for women’s choirs is Ro Ogura’s arrangement of Hotaru Koi / Ho, Firefly (ssa; Jap/Eng; Onagaku via Presser-31241520). Pana-Musica store (http://www.panamusica.co.jp/en/), with a website in Japanese and English, sells many Japanese scores worldwide. Hyo-Won Woo, currently the composer-in-residence for the Incheon City Chorale and faculty member at Seoul Theological University, is an important and innovative voice in the choral scene of Korea. Woo receives numerous commissions, has written for and worked with Korea’s leading choirs, and her works are becoming increasingly popular in international choral competitions. Her vibrant and energetic Alleluia is scored for mixed voices (8′; satb-divisi, S; Chorus Center #CCC-00007). The three-movement Gloria (13′, satb-divisi, T; Chorus Center), commissioned by the Incheon City Chorale, is challenging and exciting: a very rhythmic opening movement leads to a deeply emotional, layered, chant-like center section; the closing section mirrors the rhythmic vitality of the opening by setting the ‘amen’ as an exuberant 3+3+2 against 2+3+3 cascade. Written for the Incheon City Chorale, Jung-sun Park‘s Inchon Mass is a powerful, culturally idiomatic setting of the Latin text (satb, acap; D.J. Music Publishing). Professor at Dankook University in Seoul, Park studied composition at the Eastman School of Music (USA). 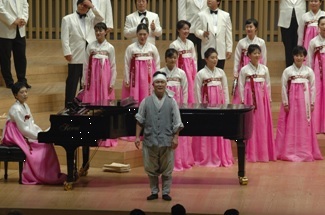 In this mass, he fuses Western structures with Korean modes, melodies (including Arirang) and vocalisms. Hak Wan Yoon and the Incheon singers have a superb recording of this work. Geon-Yong Lee, one of Korea’s most regarded composers of choral music, is also President of the Korean National University of the Arts. He creates scores that represent Korean identity, styles and forms. The “Kyrie” from his Missa AILM, written for the Asian Institute of Liturgy and Music, is scored for satb choir and percussion (AILM). Kashiri / Are You Going Away? (satb/piano or ssa/piano; Earthsongs) was composed by Tae Kyun Ham, professor of Music at Kunsan National University, for the 16th Seoul Music Festival and premiered by the Honggi Choi choir from Seoul. The treble-voice version was written for the Seoul Ladies’ Choir for their 1993 IFCM World Symposium performance. The text, a lament on leaving and loss, is a traditional lyric poem that is given a totally original musical setting. If you are programming folk music, Arirang/Rolling Hills, the beloved and elegant Korean folksong, has arrangements by Hee-Jo Kim (satb acap; Korean; Carus), Chen Yi (satb acap; Korean; Presser 312-41747), and Shin-Swa Park (ssa acap; Korean; Alliance). Or consider Jisoo Kim‘s Three Korean Folksongs (satb; Earthsongs): Gyeongbokkung Taryeong / Gyeong Palace Song, Hangangsu Taryeong / Han River Song, Shingosan Taryeong / Shingo Mountain Song. Cross-cultural musical seeds are often planted in unplanned but exciting ways. In 2009, the Incheon City Chorale performed at the national convention of the American Choral Director’s Association. There, the Incheon conductor, Dr. Yoon, met the American composer Paul Carey and subsequently commissioned Paul to write a concert mass for his choir. The Missa Brevis Incheon (satb-div), written to showcase the Chorale’s amazing bravura technique and expressiveness, premiered in Seoul in October 2009. The score is available from the composer (http://bit.ly/Incheon). AILM – Asian Institute for Liturgy and Music (info@sambalikhaan.org); Alliance Music (www.alliancemusic.com); Arcania (www.patria.org/arcana/); Carus Verlag (www.carus-verlag.com); Chorus Center Seoul (www.choruscenter.co.kr / choruscenter@gmail.com); D.J. Music Publishing (www.djmusic.co.kr); Earthsongs Music (www.earthsongschoralmusic.com); Hinshaw (www.hinshawmusic.com); Edition Kawai (www.editionkawai.jp/en/); Presser (www.presser.com); G. Schirmer (www.schirmer.com); Sulasol (www.sulasol.fi/en/sheet). I would love to hear from you with your suggestions of scores, composers or repertoire topics (mdolan@aya.yale.edu).